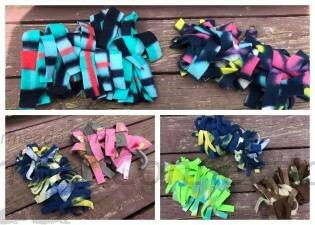 Fun fleece strip toy for you hedgie to play with. The smaller ones are approximately 4" long and the larger ones are approximately 5" long. We also have some 4" strips that are infused with lavender for an added bonus, to entice your hedgehog. *Please note... we will choose the color at random from available stock. If ordering a bag at the same time, we will try to color coordinate with your order.